So I’m just going to jump right into the recipes this time! 1) Start by pounding out the chicken breasts. Place a breast in a large Ziploc bag; using a meat hammer (or regular hammer). Pound the chicken until it is very thin, about 1/8″ thick; repeat with other 2 chicken breasts. 2) Season both sides of your chicken with salt and pepper. 3) Spread each chicken breast half with a little less than 1 tbsp of the softened goat cheese. Top with 1 slice of the prosciutto. 4) Roll the chicken into a tight cylinder; tie with kitchen twine. Dredge each chicken “roll” in flour. 5) Melt 1 tbsp of butter over medium-high heat in a skillet (don’t use nonstick). 6) Add the mushrooms; cook until softened, about 5 minutes. Remove the mushrooms to a plate, and set aside. 7) Add the remaining butter and peanut oil to the skillet (still over medium-high). Once melted, add in the chicken rolls. 8) Cook for about 4 minutes on each side, turning 4 times, for a total of 16 minutes. Remove the chicken to the plate with mushrooms. 9) Add the chicken broth to the skillet; being careful about a flare-up, add the Amaretto. 10) Bring the sauce up to a boil, and stir/scrape to deglaze all the bits from the bottom of the pan. Simmer for 5 minutes, or until the sauce has reduced by a third. 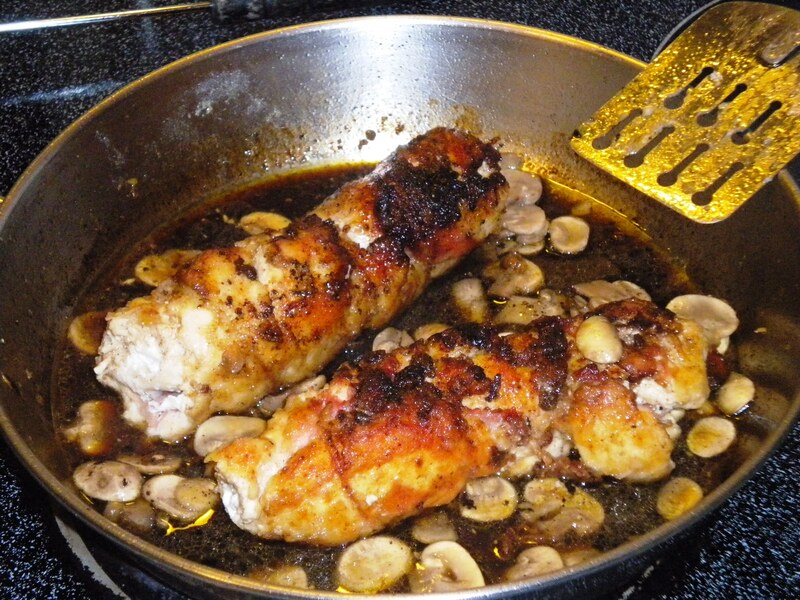 11) Return the chicken and mushrooms to the skillet, turning to coat in the sauce and heating through. No step-by-step pictures again—I’m sorry. But Lol Foodie has wonderful photos that accompany the recipe; if you need help, refer to the original recipe. And ok, yeah, I know this doesn’t sound too healthy: there is liqueur and goat cheese and prosciutto involved for goodness sake! I did modify a few things from the original recipe in the name of health: I decreased the amount of goat cheese (which I would usually frown upon); increased the amount of chicken in the equation (from half a breast to one whole breast per “roll”); and I traded some of the butter for olive oil. In addition, I limited myself to half of a “roll” with my large salad and side of carrots. In other words, it could have been a lot worse. Did I mention that this was delicious? It was: the outside was so brown and crispy; the inside was moist chicken and creamy goat cheese and smoky, salty prosciutto. 2) Peel the carrots and halve lengthwise. 3) Toss with olive oil, salt, pepper, and basil. 4) Cover baking sheet with aluminum foil; spread carrots on the baking sheet and cover with more foil. 5) Roast for 40 minutes. 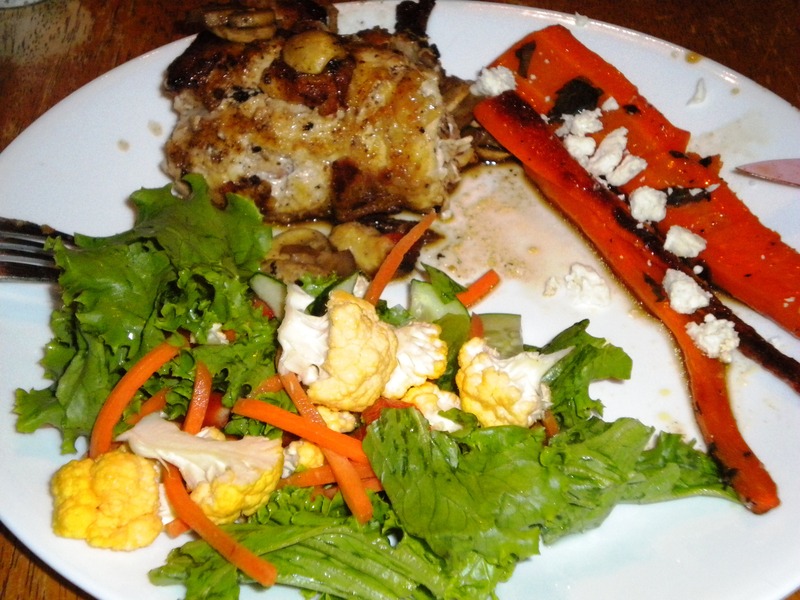 6) If desired, add feta cheese to top of carrots before serving. These were tasty! I decided to roast them the way that I normally do rather than the method suggested in the original recipe. The recipe also suggested thyme, which I didn’t have, so I happily substituted the fresh basil I had on hand. 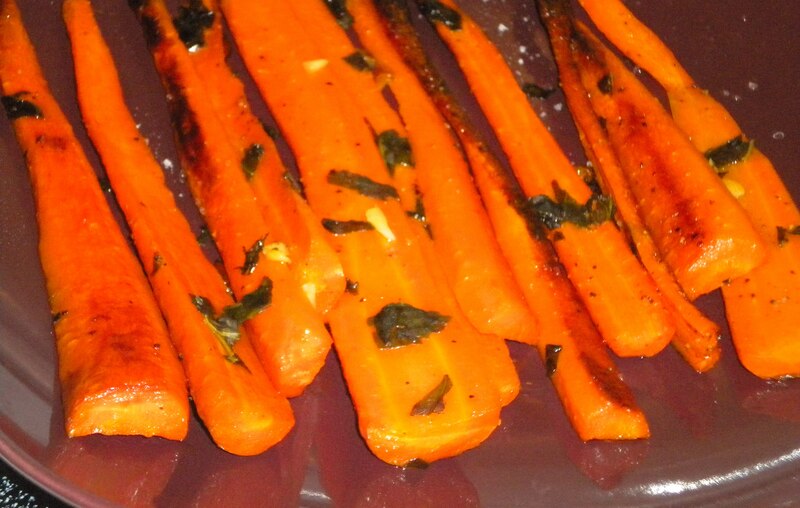 When I pulled the carrots out of the oven, I thought at first that I had burned them; the ends were black and slightly charred looking. I happily found out that the suspicious black pieces of carrot were just caramelized; they had a great chewy texture and a nice sweet and smoky flavor. The next day (Sunday) was Star Trek night at our friends’ home; these friends started the weekly tradition and so every Sunday we travel to their house to watch, drink, and watch Captains Kirk, Picard, Sisko, Janeway and Archer traverse space and battle foes. I’ve never been a Trekkie but I’m finding that I enjoy Star Trek the more that I watch of it. Anyway, I really wanted to bring something to our latest gathering because our friends are so nice to host us every week and they usually have snacks and booze for us. And that bring us to snacks! You might see a repeat of a few ingredients from other recipes I used this week and that’s because I like to use what I have in the fridge and cupboards as much as I can; that’s also why I have so many adaptations to recipes that I found online. 2) Cut ¼ inch off the top of the bulb of garlic to expose the cloves beneath; do not peel the garlic: you want to roast it in the skin. 3) Place bulb on a piece of aluminum foil; place butter on top of bulb, pour lemon juice over the garlic and sprinkle with salt. 4) Bring up all sides of aluminum foil and twist together to close. 5) Cook for 60 minutes or until garlic cloves are soft and golden in color. Allow to cool. 6) To eat, remove garlic cloves with a fork and spread on top of French bread or good crackers. If you have never eaten roasted garlic, you are missing out. The flavor is milder, sweeter, and deeper than that of raw or sautéed garlic. It is fantastic with in pasta or on poultry or steak; it is just as great with a nice cheese on a great piece of bread. Seriously, make some now. You won’t regret it. The next recipe comes from a novel. I recently finished ready Signora da Vinci by Robin Maxwell; the book is a fictionalized account of Leonardo da Vinci’s mother, Caterina. It is a really enthralling read and it is very well-written. In it, the character Caterina da Vinci often makes a compote that her aunt taught her to make. “Compote” is French for mixture but it seems to usually mean a mixture of either fruits or meats cooked on a low temperature for a long time; the result is that the meat or fruit breaks down and the flavors of the dish combine. 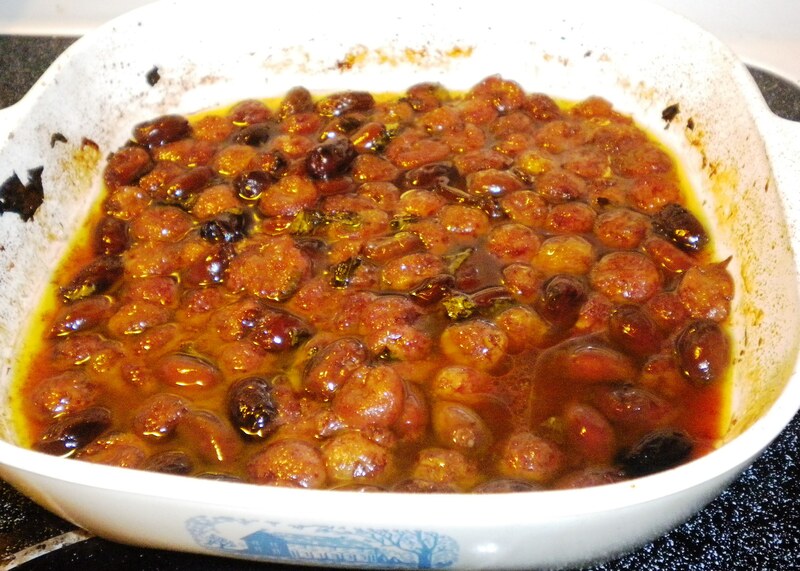 This particular compote is made with olives and grapes and fresh herbs. Yes, I am aware of how unusual this combination sounds; The Boyfriend was quite vocal in his doubts as well, and to be honest I was a little unsure of how the flavors would combine. Well all of the doubts were for naught as the compote was delicious and well-received by everyone at Star Trek night. 1) Mix all ingredients in an ovenproof dish and bake uncovered for one hour at 350 degrees, turning the fruit every 15 minutes with a spoon to recoat them with the oil and vinegar. 2) Serve warm or cold with soft goat cheese on crusty bread or with crackers, or use as a side dish with fish or poultry. My total snack spread wound up being goat cheese, a bulb of roasted garlic, the olive-grape compote, some slices of Muenster and Habanero cheddar cheeses, pan-fried prosciutto, and a loaf of sliced Italian bread. I’m big on bread and cheese so I was quite content with the finished product; and yes, this was my dinner for the evening, haha. Ok, so end-of-blog question time: what is your favorite food/recipe to bring to a party?